Don't Run Out of Propane During Your BBQ. Most all of us who use a propane tank for our BBQ know the anxiety that occurs when we're getting toward the end of the bottle. Will we have enough to finish cooking? Will we have to throw the meat into the oven to finish cooking it? Is an emergency trip for more propane in our future? The Smart Gaswatch Digital Tank Scale aims to put an end to our worries. Judging the amount of propane left in a tank may not be super simple, but it is possible. Some propane tanks have very basic indicators that may help. It's also possible to feel the side of the tank or apply a temperature strip (there is a difference in temperature between the liquid and gaseous state of propane, so it's possible to determine the current level). Probably the most accurate method is to weigh the tank on a scale. 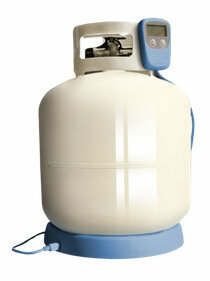 The most common size propane tank for BBQs is the 20 pound tank, indicating that it holds 20 pounds of propane. Propane tanks are made out of steel and have a very specific empty weight. This weight is called the tare weight. Empty "20lb" Tanks usually have a tare weight of around 18 pounds. You can find the exact weight of your tank by looking for the "TW" stamp on the collar of the tank. By weighing your tank and subtracting the tare weight from the total weight, you can determine how much propane is left in the tank. Propane weighs about 4.2 pounds per gallon, so a "full" 20 pound bottle should hold about 4.7 gallons of propane in it and the total weight of the tank and propane combined should be about 37 pounds. If you use a different sized tank, your numbers may be different, but the principle is the same. TVL's Smart Gaswatch Scale expands on the reliable scale/weight method to determine how much propane is left in your tank. By using a digital scale as well as a digital display, the Smart Gaswatch Scale calculates the percentage of propane remaining as well as the predicted cook time still available. A "Low Level" alarm is triggered at 20%, 15% and 10% remaining propane. The digital display is removable and can be taken indoors to protect it from weather. While there are other propane monitors (including some that require an inline hookup and a chance of leaks), at $29.95, the Smart Gaswatch Scale is a pretty decent bargain and a fairly accurate way to monitor propane usage. It's as simple as placing your tank on the scale, which can be easily located inside/behind your BBQ and then connecting the digital display. It won't keep you from running out of propane, but it should give you enough advanced warning that you won't run out in the middle of a BBQ.